Founded in 1985, Finish Software company, Basware, is a relative old timer in the world of digital procurement, account payables and e-invoicing, at least compared to many of its never competitors. The company may in fact be the inventor of the purchase-to-pay (P2P) market, 30 years ago, at least by the company’s own account (Annual report 2017). The company has grown steadily over the past years to around €150m in revenue in 2017 and 1820 employees, driven especially by growth in revenue from cloud services (19.5% growth, 2016–17). Growth driven by cloud services as a strong indication that it’s also a business and industry experiencing radical transformation these years, from one business model to another. Lars Madsen (LinkedIn) has served as the company’s Chief Marketing Officer, since joining the company in early 2016, with shared commercial responsibility to grow the company’s top-line. Coming from a position of UK Marketing Director at Canon, Lars is no stranger to marketing or transformation. In fact, most of his positions since joining Canon in 2001, had revolved around succeeding with business development, change and transformation. We sat down with him for a talk about Account Based Business (i.e. Account Based Marketing), the difficulties of transformation and the importance of total sales & marketing alignment if you want to succeed commercially in complex B2B. 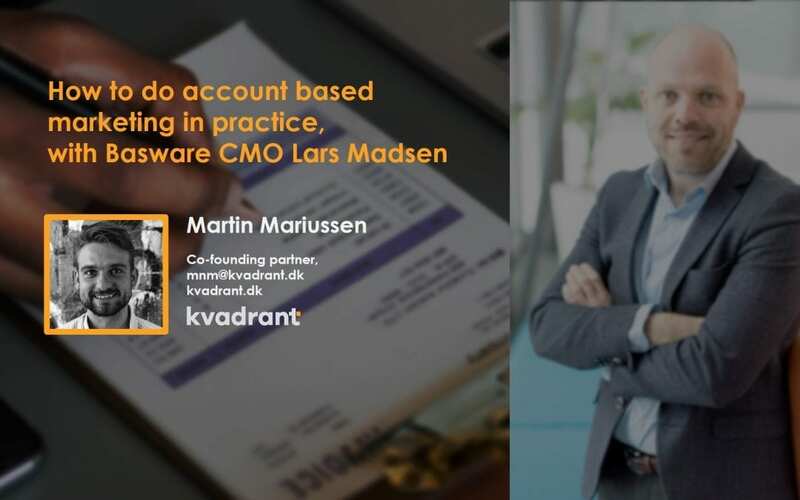 kvadrant: We get excited about B2B sales & marketing and get the feeling that you do the same. Can you tell us a little bit about your role as CMO at Basware and what you find interesting about your professional world? Lars: Sure. as CMO I’ve got the responsibility for all aspects of Global Marketing at Basware, that is, to make sure that the right people engage with us and that we engage with them effectively. Effectively meaning profitable top-line growth. Now, our business is in the deep end of B2B sales & marketing, targeting large organisations with +€200m annual revenue and high frequency of invoice handling. That usually means +9 months sales cycles, multiple stakeholder involvement, need for C-level involvement. Complex buying processes, because they are buying an important solution from us, that goes to the heart of their company; payment and purchasing. The good thing is that we have a strong, proven and quantifiable value proposition here at Basware, which enables us to clearly communicate the value on the table for potential customers. A “Value Engineering” approach; We lead with value and guide them forward. This is what the structured rationalist in me loves about sales and marketing in a complex B2B setting. Tailored and quantified value propositions, around a logical structure, using customer numbers. Even more, I like that Marketing isn’t seen as a separate “lead generator only” function in complex B2B. It can’t! To successfully navigate complex, multi-stakeholder buying processes, commercial needs to work closely together around the customer buying process. It’s a must. kvadrant: Tell us some more about your marketing approach, how are you engaging with potential customers? Lars: We’re selling big solutions to big clients that have a big impact on their business. Change like that always carries an element of perceived risk, so we need to be extremely effective at communicating why the change is needed and what the business case is for doing it. That is best done if you communicate a value proposition that is tailored to the specific customer and uses the customers’ own numbers. That for me is at the heart of Account Based Marketing, selling to a segment of 1 and tailoring your messages to that account from the beginning. Of course, this approach requires more resources per account than pumping out generic message, which is why alignment with sales becomes extremely important in Account Based Marketing. In fact, it shouldn’t be called Account Based Marketing or Account Based Sales. It’s Account Based Business, because you are not going to succeed unless you make it a joint commercial effort. Using a value calculator, with target companies’ own publicly provided financial numbers, we are able to generate 100% tailored and data backed value propositions, that we can proactively share with those potential accounts, to initiate a buying process with them. kvadrant: What has been your biggest learnings from leading successful commercial organisations in the past years, at Canon and now Basware? I think it’s important for people to understand one of the big macro changes taking place in business these years. The change from products to SaaS. This is important because this change in business model radically changes how the company needs to operate commercially. Where earlier, software companies might be selling to an IT department, they now have to develop a brand, value proposition and messages to an end user. Where sales before was the exclusive job of outbound sales, commercial interactions are now taking place in customer service, operations and on digital channels. In a world of connected buyers, customer advocacy and NPS becomes critical to manage. Change looks a lot easier in a project plan. In real life it’s challenging. It takes time align hearts and minds to a new direction and to get the organisation collaborating in a new way. The people I experience as being most successful in this new environment, are those with an open mind-set, willing to experiment, learn and develop. People that dare to try new things, even if it means failing at times. That’s what’s exciting about marketing these days; the ability to constantly experiment with your content, messages, channels and activities to find the tactics that deliver the highest growth and ROI. It’s a never-ending job of structured and systemic trail, error, success and improvement.